(ii) Skill development model in Canadian Institutions and Lessons for India. 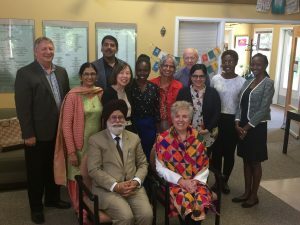 Joining Dr. Ghuman was Dr. Dhian Kaur who is a Geography Professor at Punjab University (PU) in Chandigarh and has had a long relationship with the UFV/SASI. The SASI has an active MoU with PU as well and will be sending interns to India on the Queen Elizabeth Scholarship (QES) funded project under UFV Geography Faculty Dr. Cherie Enns. 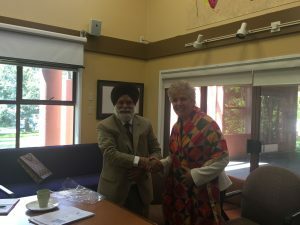 Dr. Joanne Maclean, UFV’s President and Vice-Chancellor welcomed Dr. Ghuman to UFV and echoed UFV’s commitment to the ongoing partnership between Punjabi University, Patiala. Dr. Ghuman in turn presented Dr. Maclean with an original Patiala Phulkari, a uniquely made textile out of the Punjab region.